This is a static restoration. This aircraft, although intended for non professional construction, remains dangerous. In addition, it is not certain at all to find a volunteer to fly. The Sablier type 8 Sport Chanute of the BAPA was built by Thibaut, a BAPA member, several decades ago. This glider remained unfinished, only two wings were realized. These parts were received by the BAPA in 2013. Thibaut found his Sablier-Chanute back and resumed the construction. The manufacture of the tail includes the empennage that was made following the drawings. The few inaccuracies in the instructions allowed certain freedoms of style. The fabric covering of the Sablier type 8 Sport Chanute is traditional and made with a linen fabric. Despite precise work respecting traditional techniques. The first fabric covering failed because of the quality of the fabric. Good to Know. Do not cut corners on the quality of materials. For a few tens of euros saved, tens of hours are lost. The fabric covering of Chanute is used to learn traditional covering. It is therefore normal that this operation takes time and that some minor modifications are necessary. The new fabric covering enjoy the good weather conditions of the summer 2018. 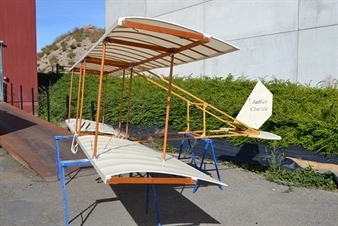 A new fabric was purchased and the trailing edges of the wings were reinforced. The elements of the tail have been redesigned to be more resistant to the tension of the fabric.